These are reported to only be about 500 years old give or take, but here they are. On the left we have a sun like object, on the right a person with spiky hair and three fingers on one hand, four on the other. Notice that it’s painted, I didn’t get a good idea if this had been painted originally or is vandalism. The sun like image is considered to be a sign of power – generally meaning a local shaman or medicine man/woman – has significant power. 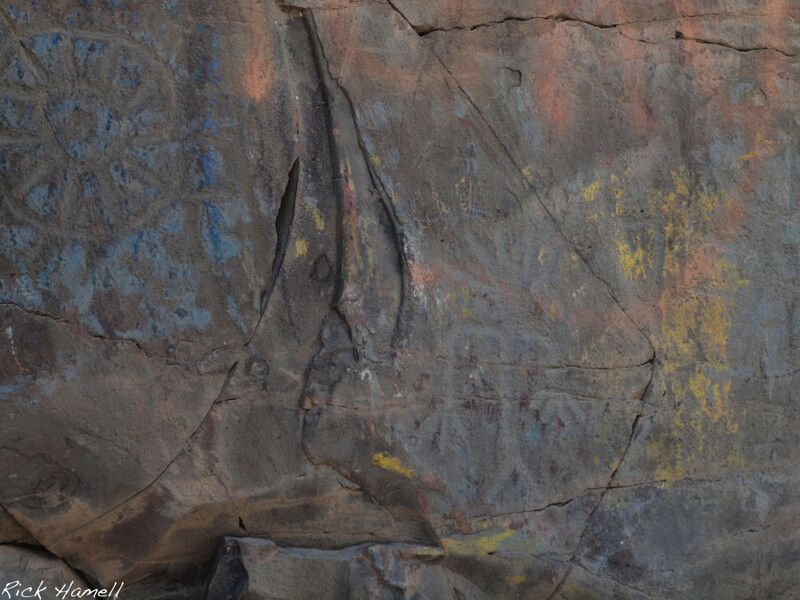 Petroglyphs are telling stories. Hi, this is beautiful. Any chance that you will let me know where it is? I am a photographer and love to photograph ghost towns, petroglyphs, etc. You can see my website at http://www.angigass.com Thanks! You can find it in Central Oregon, near Shearer’s Bridge.